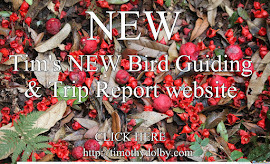 This article originally appeared in VicBabbler, a journal of Birdlife Australia. Edwards Point Faunal Reserve, an area of coastal heath, salt marshes and beaches, is a long sand spit that separates Swan Bay Coastal Reserve from Port Phillip Bay. First declared a reserve in 1971, Edwards Point contains one of the few remaining stands of native coastal vegetation on the Bellarine Peninsula. The remnant woodlands, shallow waters and surrounding salt marshes provide an ideal habitat for birds. As you enter through the main entrance you are greeted by gnarled Coastal Tea-tree (Leptospemium laevigatum) intermixed with Small-leafed Clematis (Clematis microphylla). In this habitat the birds you are likely to encounter here are Silvereye, Brown Thornbill, Superb Fairy-wren, Eastern Yellow Robin, New Holland Honeyeater, Grey Fantail, Rufous Whistler and in summer Shinning Bronze-cuckoo and Fan-tailed Cuckoo. 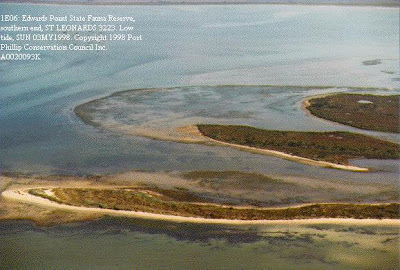 Aerial shot of Edwards Point. On the Swan Bay side of the spit there is a diversity of waders and waterfowl. These include Grey Teal, Chestnut Teal, Little Pied Cormorant, Hoary-headed Grebe, Pied Oystercatcher, Great Egret, Royal Spoonbill and Yellow and Royal Spoonbill, Marsh Sandpiper, Greenshank, Eastern Curlew, and Swamp Harrier. In the lower, wetter areas Orange-bellied Parrot may sometimes been seen feeding on the Bearded Glasswort (Sarcocomia quinqueflora). White-fronted Chat, Little Grassbird, Striated Calamanthus, Australasian Pipit, Singing and Spiny-cheeked Honeyeater can be seen in the coastal grassland, Wirilda (Acacia retinodes) and Coast Beard-heath (Leucopogan pariflorus). As you walk along the beach you are likely to come across a range of waders. In the summer months the most common waders are Red-necked Stint, Sharp-tailed and Curlew Sandpiper, Ruddy Turnstone, Pacific Golden Plover, Greenshank and Eastern Curlew which feed on the waters edge, and in winter Double-banded Plover arrive from New Zealand. 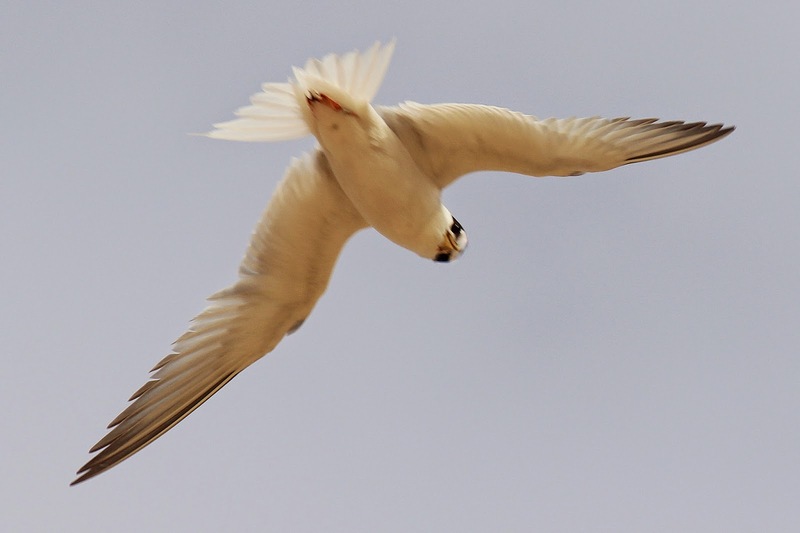 Seabirds include Sooty and Pied Oystercatcher, Silver and Pacific Gull, Australasian Gannet, Shy and, sometimes, Black-browed Albatross, Crested Tern and occasionally Caspian, Little and Fairy Tern – and in summer the piratical Artic Jaeger. In the last few years Fairy Tern have started nesting at the tip of Edwards Point. 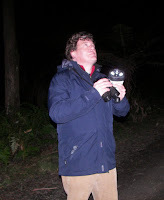 W. Roy Wheeler once described the Bellarine Peninsula as the best bird spot in Victoria. Aside from Orange-bellied Parrot, some of the rarer birds that can be seen at Edwards Point include Sanderling, Red Knot, Great Knot, Terek and Wood Sandpiper, Hooded and Grey Plover, Lesser and Greater Sand Plover, Great Skua, White-bellied Sea-eagle, Tawny-crowned Honeyeater and Chestnut-rumped Hylacola. Finally, for me, one of the best things about Edwards Point is that is a great place to view large flocks of Australian Pelican, Scared and Straw-necked Ibis, with a constant stream of these majestic birds flying overhead. It also provides you with a sense of coastal wilderness - unusual for a site on Port Phillip Bay. Edwards Point Faunal Reserve is located in St Leonards, east of Geelong on the Bellarine Peninsula (Melway ref: 241 H12; Key map: 16). Take the Portarlington Road from Geelong and turn off at Murradoc Road. Turn then to Bluff Road and turn right at Cliff Street and then follow Cliff Street as it winds around and then turn left onto Beach Road and follow it to the beach. A well-defined walk follows the management track (to the right of the large Faunal Reserve sign) down the centre of the spit then returns along the along the sandy eastern beach. A round trip takes about one to two hours but it is well worth the effort. Reporting rate for a single observation is 2%.